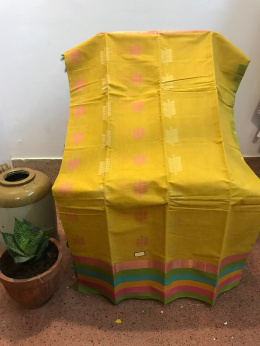 Grey and Mustard Handwoven Kanchi cotton saree. There is an attached blouse piece inside. This product has been woven by hand and may have slight irregularities that are a natural outcome of the human involvement in the process. SHIPPING INFO : dispatched in maximum of 3 business days. Returns accepted within 10 days of delivery only if the tag is in tact and the product is in its original condition.